Coming to my experience.. it was a Sunday - a lazy Sunday. I was in front of the computed by 0755hrs. I tried opening the IRCTC website on a recce to see if things were okay. The website was already down! The dreaded Service Unavailable message was displayed every time. This meant that my chances of getting a ticket was very bleak. I decided to give it a try, no matter what. 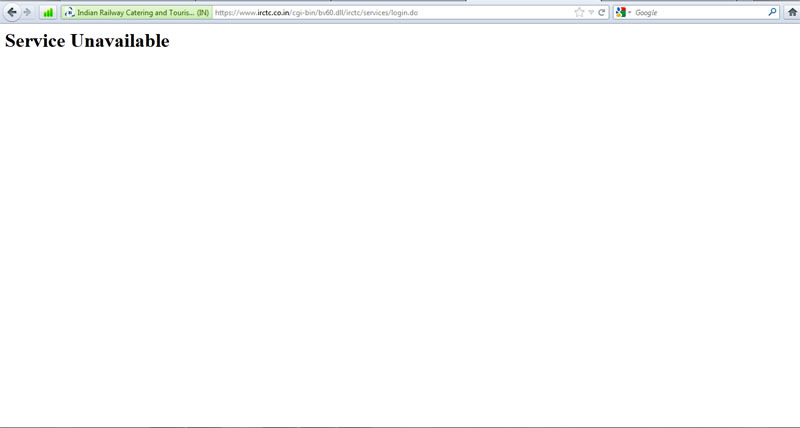 The website kept displaying the Service Unavailable message all the time, till about 0805hrs. In the meantime, I had opened the availability page on the indianrail.gov.in website. Thankfully, all the 10 seats in Tatkal quota was still available, even at 0805hrs! 0815hrs: I was still repeating the log in - Service Unavailable - refresh - log in - service... routine. At one point, it went till the booking page, when I remember that I did not have my identity proof handy. I rushed to get the identity card, and entered the details. Service Unavailable again! 0830hrs: The gold medal is still elusive. The number of available seats slipped from 10 to 6. My blood pressure begins to rise and anxiety levels increase. I am still alternating between the Home page and the Service Unavailable message. 0855hrs: I get a call from my friend to know if I crossed the finish line.. I was still start the race, forget reaching the finish line. The number of seats available slipped one position down to 5. By now, I have three browsers open, each one of them trying to get into IRCTC. None of the browsers managed to go past the home page. 0900hrs: I stick to my tried and tested, trusted browser to do the job. The home page opens after a lot of struggle, but the next page is always the Service Unavailable message. 0905hrs: I manage to get past the home page, to the "Plan my travel" page. I enter my origin and destination, and the server responds. I select the required train and press "book". Fingers crossed. The server responds, and asks me to enter the passenger details. Details filled in, and proceed. It heads to the payment page. My bank responds swiftly. Now begins the agonising wait... will I lose my money and the server times out? Or will I get a waitlisted ticket? 0908hrs: I check the availability page, and note that availability has slipped one more position to 4 now. The browser is still "connecting". About half an agonising minute later, the IRCTC page opens. I got a ticket.. er! a Medal! A confirmed ticket.. a hard earned ticket! The server take about 2 minutes to process my Print command. It took me exactly an hour and 8 minutes to book a ticket. All this even after IRCTC tightening the usage of the website by restricting travel agents from using the portal from 8AM to 10AM (?? ), restricting the number of transactions per IP address and what not. With the railways increasing the Advance reservation period to 120 days (from 90 days), tickets for the summer vacations got sold off long back. Booking on the IRCTC website is a horror - especially during morning hours. The website is really slow - horribly slow. The railways flushes down enough money on vote-garnering schemes (like the Izzat ticket - a scheme that is heavily misused), and ends up not having enough money for upgrading their booking systems. Southern Railway ritually releases a press release claiming how quickly their servers manage to book tickets during the Diwali season - they even claim that majority of them are booked online. I wonder how do so many tickets get sold online given the dismally slow servers of IRCTC. Its high time the railways spends some money on upgrading the servers at IRCTC. The railways had announced a new website to book ticket - a website that never ever opened! It took ages to log into that website - that website really made IRCTC look fast. All said and done, I successfully got a ticket for a long train journey, after a long time. The 8-hour journey that I make tomorrow would be my longest by train in recent times (discounting the passenger train journey from Nilambur Road to Ernakulam Junction). Stay tuned for a report on the hard-earned journey. Last Wednesday, I got Thatkal tickets at 8:45 am, and very surprisingly, only 1 ticket was sold off before mine! Till 08:45, I never went beyond Plan my Travel Page. If you encounter the "Service Unavailable" message, just click on the refresh button. Just the refresh button, do not enter on the address bar. Just do it some 3-4 times. If it does not load even after 4 times, same message means close the tab and try again.